The dual use (civil and military) SGDC Geostationary Defense and Strategic Communications Satellite built by Thales Alenia Space for Brazil is ready to be shipped the Kourou launch pad in French Guyana to be launched by Ariane 5 rocket next March. Artistic rendition of the SGDC Geostationary Defense and Strategic Comms satellite. Image is courtesy of Thales Alenia Space. Thales Alenia Space signed the SGDC contract with Visiona (a joint venture between Embraer and Telebras) at the end of 2013. This program plays a key role in the Brazilian Space Agency’s Space (AEB) development plan, while also addressing the Ministry of Defense’s strategic requirements. It is designed to meet two main objectives: the implementation of a secure satellite communications system for the Brazilian armed forces and government; and support for the deployment of the National Broadband Plan (PNBL), coordinated by Telebras as operator, which aims to reduce the digital divide in the country. The SGDC program is an integral part of Brazil’s strategy to reinforce its independence and sovereignty. 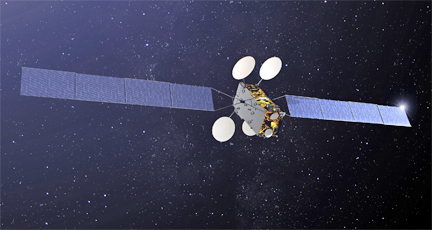 Thales Alenia Space has established a unit at the San José dos Campos technology park in Brazil, to work more closely with its local customers and partners. It has met its skills transfer commitment, since over 30 Brazilians engineers have been trained in all space engineering techniques, supervised by the Thales Alenia Space program team. An aluminum battery support panel made by the Brazilian company CENIC is already integrated on the SGDC satellite. Technology transfer contracts with Brazilian industries are in progress in order to allow for their involvement in future space projects.